Video that George Zimmerman's defense team says was extracted from Trayvon Martin's phone shows two men fighting, apparently over a bicycle or an incident involving a bicycle. SANFORD, Fla. — Experts dispute whose voice is heard in the background of a 911 call from the night Trayvon Martin was shot and killed. A police detective, Chris Serino, wrote in an early report that he could hear a man yelling “Help” or “Help Me” 14 times. Prosecutors say the voice is Martin’s. Defense lawyers say it could be George Zimmerman, who they say was being pummeled by Martin. Now, as Zimmerman prepares to go on trial on a charge of second-degree murder, a video has been released that the defense says could help authenticate the 911 call. But lawyers for Martin’s family say it doesn’t belong in court. 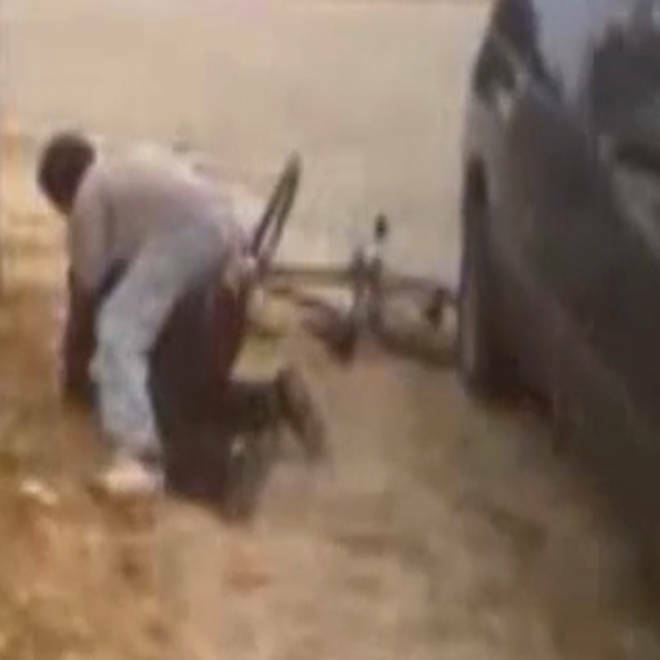 The video, which the defense says was extracted from Martin’s phone, shows two men fighting, apparently over a bicycle or an incident involving a bicycle. Zimmerman’s lawyers say Martin took the video, and that a voice on the recording is his. The person recording is not seen. Under Florida evidence-sharing rules, prosecutors and the defense have had the clip for some time. The video was released by Zimmerman’s defense through a website where his lawyers have been posting press releases and possible evidence. Members of Zimmerman’s defense team say they have a policy of making evidence in the case available to the public, and that the tape is the only known sample of Martin’s voice. Kendall Coffey, an NBC News legal analyst, said that Zimmerman’s lawyers would have to show that the video is relevant enough to the case to overcome its potential for prejudicing the jury. The video came to public attention after it was mischaracterized during a recent hearing, when defense attorney Mark O’Mara said the material depicted Martin’s friends beating up a homeless man. The defense later issued an apology and clarified the nature of the recording. Vincent said that the video was released in part to further correct the record. NBC News has not independently authenticated that the voice is Martin’s. Ben Crump, a lawyer for the Martin family, says that Martin’s own mother isn’t sure it’s his voice. Another lawyer for the family, Daryl Parks, says that’s not the issue. “The tape does not belong in the court,” he said. In a June 5 order, Judge Debra Nelson said text messages from Martin’s phone could not be used in opening statements by either side. During the trial, she ruled, lawyers will have to argue the relevance of the material before jurors see it. The judge also has yet to determine whether a jury will hear from experts about the screams on the 911 tape. Testimony from experts in recent days conflicts: A state expert says the person screaming is Martin; defense experts say it’s impossible to tell. The testimony came as part of an ongoing hearing to determine whether jurors will hear from experts on either side. The judge will have to decide whether research on the tapes meets appropriate scientific standards. Zimmerman has pleaded not guilty to the charge of second-degree murder. Jury selection begins Monday. Five hundred jury summonses have been issued, and it is expected to take two weeks to choose six jurors and several alternates. Editor’s note: George Zimmerman has sued NBCUniversal for defamation. The company has strongly denied his allegations.